You must make reservations at least 5 minutes in advance of the time at Braza Churrascaria - Darling Harbour. Wilson Carpark - 1-25 Harbour St. Whether celebrating a special occasion with family and friends or hosting a corporate event, Braza can accommodate all your special event needs. The Bar, inspired by one of the most popular places in Rio de Janeiro (Lapa) takes its name, Braza Lapa Bar, which is an attraction not to be missed - presenting the first Cachaça Bar in Australia (Original Brazilian Spirit made of Sugar Cane), a selection of more than 80 types of beers and up to 160 types of wines - everything followed by a delicious Bar menu, which was made to match perfectly with this variety of drinks. 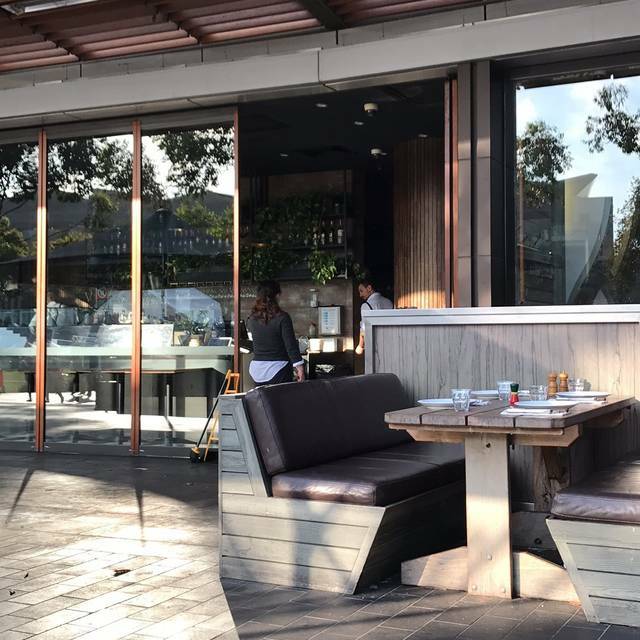 It's a good option for those, who are just walking around Darling Harbour and are simply after a relaxing time. I have been many times for dinner, but this was the worst... food really poor! We had to wait couple of time for the meats come around ( 5-7min to be served) meat over cook and under cook!!! I wont be back. Anyway the dessert saved the night, but the meat really desapoint me!!! I was expecting more meat and better meat quality. We spent more than 1 hour there and the service was quite slow, we didn’t have the chance to eat all types of meat that was on the menu. And the meat we ate was sometimes cold or very dry. I hate well done meat. But considering the price I was expecting much more! Food was amazing my partner is from Argentina they have good meat but Braza have good meat as well service was good and the price is worth paying for it the waitress was good food and drinks got delivered on time . Definitely would come back to eat . Great food and atmosphere to take work colleagues for lunch and dinner around Darling Harbour. I have been there with other 8 work colleagues during lunch time on a Monday, and everyone was very satisfied with the portions and overall quality. The menu was easily explained and quick to get the flow of food going. The entertainment was great! !..went around the whole restaurant so it did not matter where you were seated. Only when the drums were playing was it to loud to talk, but we were watching the show that for that short time it did not bother us. I highly recommend making a booking as we would have been stuck without it. Very close to Town Hall train station in regards of transport. The staff were lovely and friendly, the drinks were refreshing and the food was flowing! Could not have asked for a better night! Don’t go for special occasions, they will NOT make it special for you at all. They are all too busy they won’t even know what occasion you are there for, even though you brought our own cake ... they just drop off the cake and that’s it... food was incredibly all salty (and yes it’s a known tactic for all buffet style food. Make it salty and make it hard to consume a lot and can easily push for more drinks) but it was really too salty.. I remember 4-5yrs ago it was a nice place eat but not anymore. I come here for the food. This is my third time at Darling Harbour this year. Never been disappointed. Never fails to impress my family & friends. 5-star food & service. First churrasco for my children, something we cannot have in the town we live - we enjoyed Sunday lunch with loads of meat and fresh sides very much. All the staffs were very pleasant, too. Would be fun to join when soccer world cup is on. Thank you very much for offering the blissful atmosphere and meals! We were quiet disappointed in the service, we didn,t get all of the dishes, definately not the amount on the menu and we dont feel that what we had was worth the money. But what we did get was very tasty. We will go elsewhere next time. First time coming with my husband. We sat outside and it was perfect. Although its pricey the food was great, and the staff was so friendly! We will definitely be coming back! 10/10 for everything! Food, service, atmosphere, everything was fabulous! The flavours of the meats were out of this world and the sides complement them perfectly. The sangria was delicious too. I’ve already told my family and friends they need to try this place! 100% will be back again soon. Food and service was great! Really enjoyed our night. Pineapple was by far the best. We have been to many Brazilian barbecues in Brazil, Mexico, US, portugal and UK this was a very unpleasant experibece first of all they only offered the prime meat cuts once and the service was terrible. Obe we asked for more picanha it was practically roasted as they didn't want to barbecue a new piece I imagine because the closing time was 1 hr away. Also I mentioned it was an special ocassion my partners birthday and they couldn't care less they didn't even made the effort to send a 5dls cake slice with a happy birthday. Terrible experience I wouldn't return again and I don't recommend it. Came with a group of 8. Fantastic service and the food was absolutely amazing. Well worth the money spent. Drinks are also very reasonably priced compared to other places around Sydney. It's no split bill though. Highly recommend!! Food and service is good, would recommend definitely recommend Braza to friends looking to enjoying a fulfilling meal with pleasant company. I'll start with the one real negative - The book-in/seating was an absolute mess. We'd booked well in advance, and let the staff know we were there. We were told to wait at the bar or outside to be seated, and when other people started lining up to be seated - they were seated first. Not cool. We were still there 10 minutes into our booking time, which given it was a timed booking...would rather this hadn't happened. The waitress assigned to our area was friendly, warm and courteous - taking the time to explain how things worked there for our dining experience. 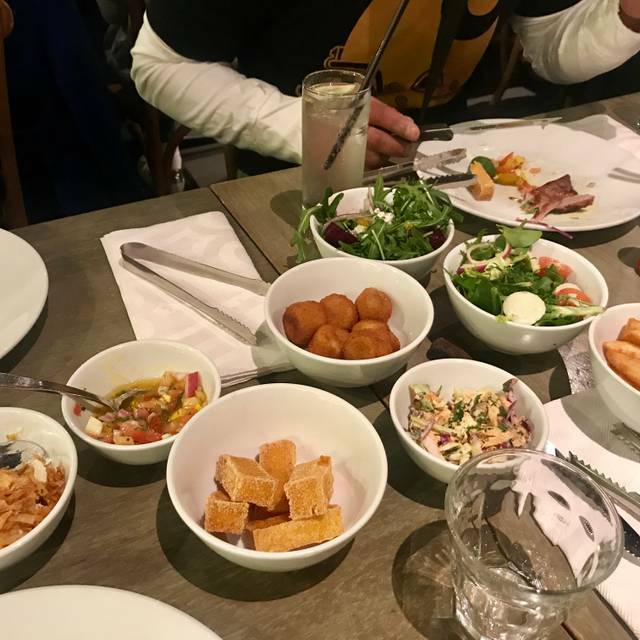 The service in general was very good - the guys bringing around the various items from the BBQ were attentive, friendly and accommodating - our table requested a few times to have more/larger/smaller pieces of certain things. The appropriate information was given. One thing though - I felt as though there were certain groups of tables that seemed to get a lot "luckier" with the frequency and availability of certain items...I think the routes could use some work. The food for was delectable. All served hot, seasoned well and not just the "same flavour on every meat". The pork neck was Godlike. The little teardrop chillis were delicious. The garlic bread is some of the best I've ever had. The chicken hearts...try those. Seriously. Sides were all very nice too, served plentifully and replenished as needed. Table water was bought and removed periodically. I ate SO much...it's very tempting...you just look at the quality and smell these things as they're going by, and I was saying "yeah, ok" several times past the point of full. I'd give the food an 8/10 - the mojitos were first class too. Ordered a creme caramel off the menu too. Wow. Also - You get your bbq FREE with your birthday. That's about a $60 birthday promo. You don't get many b'day deals that compare to this. All in all, despite a couple small hiccups - excellent night out. I'd recommend it. Just skip any other meals that day. I would recommend going to the Leichardt Braza instead. It is much less noiser and cramped. The service was not speedy. The flow of meats from the Traditional Churrascaria was not steady. Several times we had to ask for water and sides. Hello, my friends and I had a easy time lovely food, Sensational. Amazing food and lots of it. The service was great! Very good !!! Nice personnel !!!! The food was amazing. The service was great. However would like to have known beforehand that when you book for a birthday you need a minimum 3 adults for a discount or 5 for a free bottle of wine. Wasn’t expecting much but at least something for the price and the specification prior to booking. Loved it 2nd time round and enjoyed it even more, our friends that we brought also enjoyed it alot. Good food and great service. There was always someone ready to offer us food which was great, our plates were never empty. A bit on the expensive side and not much variety when it came to non-alcoholic drinks. Absolutely loved the vibe and food at Braza. Will highly recommend to my friends and we will be back! Food was to die for. Thank you for a great night and experience! What an exciting and filling experience! This was my families first experience at a Brazilian BBQ and it was unlike any other dining experience we’ve had:) we were a group of 8 and were seated at our exact booking time, within seconds we had table water, drink orders taken and the dinner was explained to us and almost immediately the food started arriving. WOW! There were so many staff with so many options we had pretty much accepted the first 10 offerings without having much chance to eat yet!! The food was delicious and of great quality, a couple of offerings were a little charcoaled, but you can always decline at that round and it was a certainty that they would be back around soon enough with a fresh offering. The variety was fantastic and we happily finished on a delicious barbecued pineapple offering! Yum!! Perfect to finish off the meal. The only reason this review is not completely 5 star was the noise level did make it hard to hear the staff and food offerings could have been a little less frequent:) overall HIGHLY recommended! Great food, and the staff are attentive but not overbearing. It was a very good experience. We booked a table for 2 at 19.00 and stayed until close. Highly recommended! You will need to arrive with an empty stomach to eat and enjoy the food. Lovely food, great atmosphere, friendly staff.